Coverage: Live on S4C, BBC Radio Wales, BBC Radio Cymru & BBC Sport website and BBC Sport app, plus live text commentary. World Rugby has admitted a mistake was made by the television match official in Wales' 12-6 defeat by England. 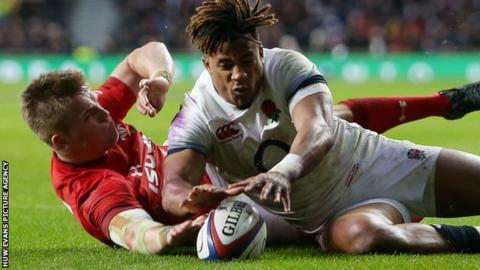 TMO Glenn Newman ruled Anthony Watson had beaten Gareth Anscombe to the ball, with Wales coach Warren Gatland describing it as "a terrible mistake." "That dialogue happens continually throughout international periods," he continued. "That phone call took place yesterday and Alain Rolland confirmed on behalf of World Rugby that it was a mistake. "I haven't spoken to any of the match officials. It's happened, it's disappointing that happens in professional sport. But we focus on the next two weeks and getting ready for Ireland." The governing body added: "In accordance with law 21.1 b, Wales should have been awarded a try as the Wales player grounded the ball." Six Nations 2018: Should this have been a try for Wales? England coach Eddie Jones criticised World Rugby for "retrospective refereeing". He said: "I'm on a good behaviour bond so I've got to be careful what I say, but I just think that once the game's done and dusted that's the game. "You can't have retrospective refereeing of decisions being done. The game's done and dusted, so we've got to trust the referees and respect their integrity. "When I say respect the referee, that's the TV process as well. You leave it at that, and then you get on with it. One side's won, one side's lost." Jones also compared the incident to a batsman being wrongly given out in a cricket match. "The decision is made, that's the game and I'm sure Wales are upset about it and I can understand why, but the game is gone." However, Howley did have good news for Wales in terms of injuries before the next match with Ireland. Leigh Halfpenny, Dan Biggar and Taulupe Faletau are all expected to return to full training by the end of the week. Halfpenny will take some part in training in "the next few days" after a foot infection forced him to withdraw from facing England last weekend, while Biggar is expected to take a full part in training by the weekend. But hopes that Faletau would feature for Bath at Newcastle have been dashed, despite Warren Gatland's preference for him to play club rugby before any international return. "Toby came through some really good training with Wales, he did a bit of a contact session so that's really good," Bath director of rugby Todd Blackadder told BBC Radio Bristol. "He certainly won't be ready this week for us, but hopefully in the not too distant future." Howley also confirmed Saracens' Liam Williams came through his return match without problem but wing Alex Cuthbert is out of the squad because of a knee injury. Gloucester say that back-rower Ross Moriarty will miss Saturday's Premiership match at Worcester because of a shoulder injury. However, they expect Moriarty to be available to face Ireland.